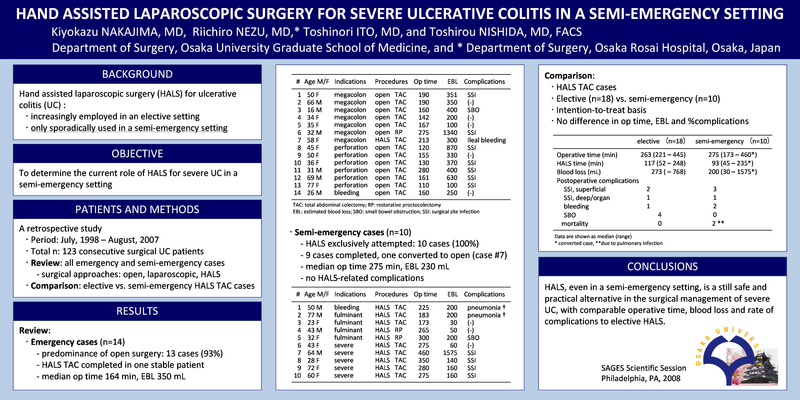 Background: Although minimally invasive approaches have been aggressively employed for ulcerative colitis (UC) in an elective setting, its use in a semi-emergency setting has been only sporadically reported. The objective of this study was to determine the current role of hand-assisted laparoscopic surgery (HALS) for severe UC in a semi-emergency setting. Methods: A retrospective study was conducted using dedicated UC database which includes 123 consecutive restorative proctocolectomies (RP) and total abdominal colectomies (TAC). 1) Cases undergoing emergency/semi-emergency surgery were reviewed. 2) Surgical results were compared between elective HALS-TAC cases and emergency/semi-emergency HALS-TAC cases. Results: 1) Fourteen emergency cases (megacolon 7; perforation 6; bleeding 1) and 10 semi-emergency cases (severe/fulminant diseases including 2 bleeding cases) were reviewed. For emergency cases (n=14), open surgery was predominantly performed (13 cases (93%): 12 TAC and 1 RP), nevertheless HALS was used successfully in 1 TAC. Median operative time was 164 min and blood loss was 350 ml. For semi-emergency cases (n=10) in contrast, HALS was exclusively attempted and completed in 9 cases (7 TAC and 2 RP). One fulminant case was converted from HALS-TAC to open-TAC due to severe tissue friability. Median operative time was 275 min and blood loss was 160 ml. Postoperatively two semi-emergency patients died due to pulmonary infections. No HALS-related complications were noted in the series. 2) Ten cases with emergency/semi-emergency HALS-TAC were compared to 18 cases with elective HALS-TAC on intention-to-treat basis. No significant difference was observed between the two groups in terms of operative time (275 vs. 263 min), HALS time (93 vs. 117 min), blood loss (200 vs. 273 ml) and rate of postoperative complications. Conclusions: HALS, even in a semi-emergency setting, is still safe and practical alternative in the surgical management of severe UC, with comparable operative time and blood loss to elective HALS.